The view of this house is another example of how modern intrusions such as power lines and traffic lights can compromise a structure’s integrity, albeit unintended. 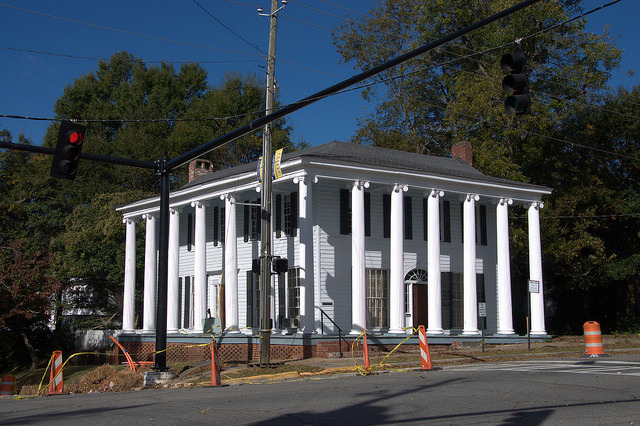 Located at the corner of Wilkinson and Greene Streets, this house was originally builit in the Federal-Transitional style, but the later Greek Revival additions have come to define it. The thirteen columns are said to represent the thirteen original colonies. John Marlor (Marler) is thought to be the architect. Other families who have owned this landmark include: O’Brien, Beecher, DeGraffenreid, Calloway, and Conn.